Concentrates are extracted from the trichromes of Cannabis flower. Trichromes contain over ninety-five percent of the phytocannabinoids found in the cannabis plant. A concentrate is a waxy, oily paste that is typically ingested, smoked, vaporized or blended with a filler to complete the product. TINCTURES are a liquid preparation of Cannabis. 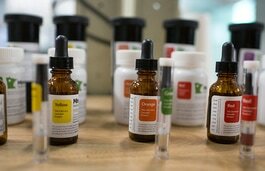 Medicinal oils from the Cannabis plant are extracted and blended with a liquid base. The base can be coconut oil, olive oil or ethanol. Tinctures are either applied via dropper either sublingually (under the tongue) or ingested. TOPICALLY applied Cannabis is presented as a lotion, cream or salve directly applied to the skin. They are intended to treat superficial skin infection or inflammation and deep joint or muscle pain or inflammation..
Vape Pens are a compact, convenient way to inhale Cannabis. The cartridge typically contains a concentrate with or without a filler. The "pen" is a battery operated heating element with a metal tip from which the vaporized oil is inhaled. Some cartridges also contain terpenes, which gives the vapor an aroma. The Cannabinoids and Terpenes in Medical Cannabis are plant derived chemicals that interact with the body's Endocannabinoid System. • Terpenes are another family of chemicals found in the Cannabis plant. Terpenes produce an aroma as well as interact with the Endocannabinoid System. The Cannabis plant creates at least three distinct groups of terpenes producing a Floral, Fuel or Earth aroma. • Medical Cannabis products are sold as flowers, tinctures, concentrates, topicals or vape pens.